I am still on cloud nine from my son’s wedding and entertaining out of town guests…so I am making this rather short today! Please come by STB and see what the team and our Guest Becca have done with our topping of Circles. . Your card is so beautiful. Great colors. Pretty card and pretty colors. I know you are still on cloud 9 from that beautiful wedding. So enjoyed seeing all the pictures. Big Hugs, my friend. Beautiful card Nancy. I have been enjoying seeing all of the wonderful pictures of the wedding. It looks like you had a wonderful time. Congrats to you and to the happy new couple. The link to the card you were inspired by doesn’t work, Nancy, but that’s okay. I don’t need to compare since your card is lovely on it’s own. I love those big polka dots and they made wonderful flowers. 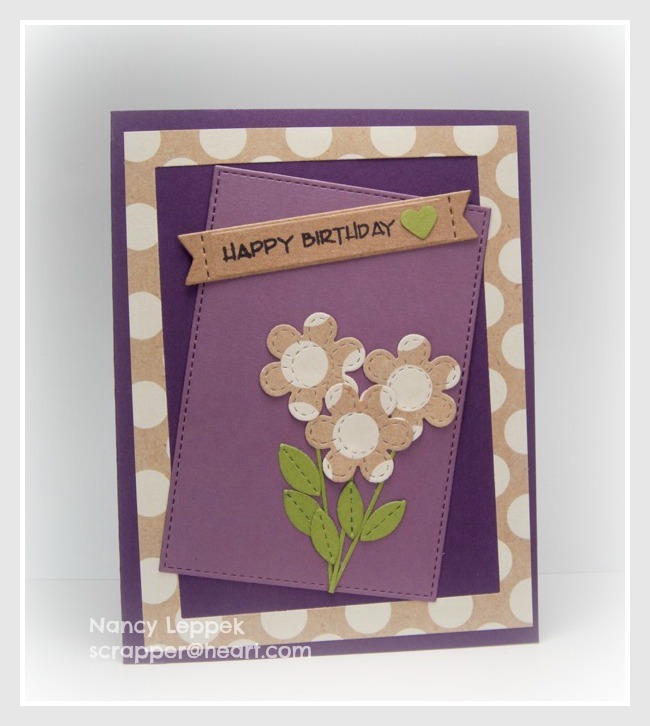 Great idea to use the big polka dot paper, Nancy! Love those daisies, I might ‘need’ those dies, lol! These flowers are gorgeous! Love the colours too.